This vigorous, easy to grow perennial sports vibrant golden foliage with gentian-blue flowers. Commonly known as a spiderwort, Tradescantia Blue & Gold is a good plant for novice gardeners because it's so easy to grow and the flowers and foliage are so attractive. It grows in many soil types, even wet, boggy sites, but it thrives in moist, well drained soil. Cut back after the first blooms in July and August, and it reblooms come fall! 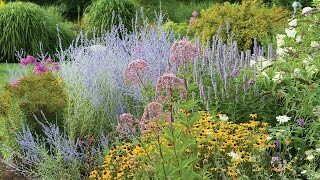 Choose a location in full sun or part shade, with moist, well-drained soil. Plants tolerate wet locations. 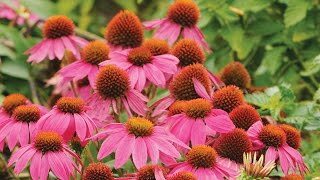 After the plants flower, cut them down to about 6 inches for more compact foliage and to encourage new blooms. Divide plants every 3 to 4 years in spring to prevent overcrowding and to keep them spreading too quickly. Tradescantia, Blue & Gold is rated 3.8 out of 5 by 12. Rated 5 out of 5 by SueNJ from As expected I have had previous experience with this plant before. They take a couple of years to grow and spread to full size. You will appreciate them more the second year. It's a very hardy plant. Have patience. Rated 3 out of 5 by Sten from Fatal Attraction So beautiful, and such a wicked thing. It doesn't spread beyond a good-sized clump- but then it shows up everywhere by seed. It's not so difficult to remove as say a Japanese Iris, but you do have to work at it. If you want it, be ever so careful to deadhead it even before it quits blooming, every year. Rated 5 out of 5 by Kite from PERFECT I purchased 5 plants from Burpee, and only 4 lived. It wasn't their fault, it was my teenage daughter who killed the plant with a vehicle. I have attached one pic of one of my plants. They are all 24" tall and have doubled in width since last season. I wish I could purchase another 30 plants for the rest of my yard! Rated 5 out of 5 by DebP from Beautiful Flower! This flower is nearly purple to me - a wonderful contrast to the bright green foliage. I planted it this spring and it has grown well and is now blooming well in late summer. It is in average soil and receives sun only in the mid and late afternoon. Very pleased! Rated 1 out of 5 by bbstar from BEWARE THE SPIDER WORT Beware! This is one of the most invasive plants we have come in contact with. Research carefully before purchasing. It is an annoying weed, hard to get rid of. In fact, most research I have seen suggests that burning it is about the only way to eradicate it.